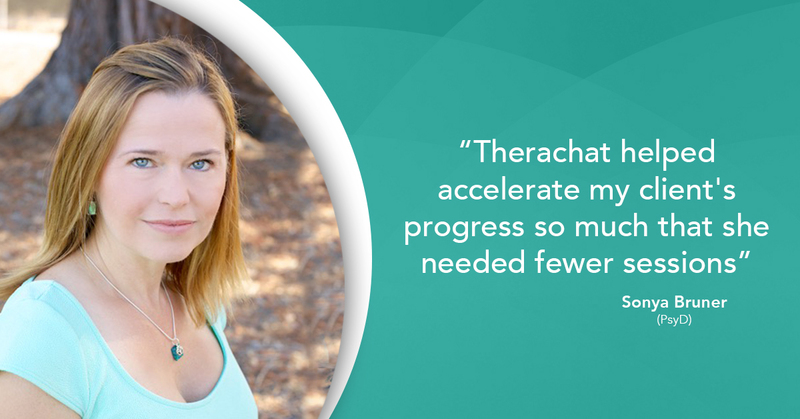 When we talk with our Therachat users, we notice that each therapist has a story to tell that just about anyone can benefit. That’s why we decided to kick off a series of interviews around specific topics. Today we talked with Vivien, a motivated private practice clinician that fully embraced the power of technology and happily wanted to share tips and tricks. To kick it off: tell us a bit more about yourself. How did you start your private practice? I started my private practice initially part-time while working full-time at an agency. I saw people in the evenings and weekends and had a 5 year plan that I would eventually have enough clients to leave agency work and go full-time but in about a year I was able to accomplish what I thought would take 5 years and left my full-time position to run my private practice as my primary occupation. Wow. That is great! What makes you get up each morning? My alarm! I love what I do and I remind myself often that I am lucky to be able to say that, not everyone can and I get that. I love being able to work with people and use my skill set to assist others on a part of their journey! Which tech tools do you currently use in your practice and what for? I use a lot of tech tools. I use Evernote to keep client handouts on the ready and can provide a link to access worksheets or other information I want to share. I use Trello to manage upcoming workshops, design group curriculum, plan out my newsletters and manage social media. I use Feedly to pull in articles to share on my social media. I use a variety of apps for meditation with clients and of course, Therachat. That is quite a list. How did you get into that? I have always loved technology! I played Atari, Intellivison (yes, I am totally dating myself) and my first computer was a Commodore 64. I have always had an interest in technology and knew that I would incorporate into my practice right from the beginning. It is another way of communicating and it isn’t going anywhere! How do you, as a clinician, benefit incorporating tech tools in your private practice? I find it makes me more organized and efficient. It is important to me that I am comfortable with technology as there is a part of my practice that is online. I am seeing clients through a HIPAA compliant platform and ensuring that whether they are in my office or online they have access to the same set of resources I provide. How do clients benefit your digital approach? The feedback I hear is that they really like it! My clients know that I am also interested in learning about a new technology that has benefitted them in some way and so they often share new apps, podcasts or tech info they have and want to recommend. Let’s talk about Therachat for a minute, how do you use Therachat? I offer Therachat to clients in my practice who would benefit from added accountability and tracking outside of session. It is not required but about 75% of my clients use it on a consistent basis between sessions. I find the different trackers to be beneficial. Being able to review with a client how their distress level or emotions have been between sessions helps give us a real perspective on what we are working with. I also like getting honest feedback in the “how did last session go” prompt as well as “what do you want to discuss next session” prompt. Clients share that they like that as well. I also have certain activities scheduled ahead of time for clients who have indicated when they feel increased levels of anxiety. I provide journaling prompts for some clients who find reflective writing between sessions to be helpful. There are a lot of ways to use Therachat and I am able to collaborate with the client on what their individual needs are. What do your clients say about Therachat? They like it! I have clients who have used it quite frequently for a period of time and then slowed down and then picked back up as things changed in their lives. I also have clients who use it consistently on a daily basis. The flexibility is great! How do you think the mental health field can benefit from technology? The reality is technology isn’t going anywhere. We can find all the reasons why it won’t work or all the reasons it will. Having the technology available to us provides an opportunity to reach people who may not have been reached previously. I have some homebound people that I see online, I have people with multiple conditions that find consistency in any of their care to be an issue for them but keep our appointments weekly, and people that don’t have the resources nearby can now be seen by a qualified professional without having to wait months for an appointment; those are all wins in my opinion. I also should point out that not everyone wants to use technology in their course of treatment or that it may be appropriate for them but that is where the conversations between clinician and client need to happen. What is missing in the field from a technological standpoint? I think the biggest thing missing is a cohesive message about use. Telehealth has been around for over 20 years and we are playing catch up in the mental health field. I talk to other mental health professionals who will say, “x is allowed” and another who will say, “x is not allowed”. All this inconsistency makes providers nervous to move forward in using technology. Our policies have to keep up with the technological advances happening and we need people dedicated to making that happen or we will always be one step behind and missing opportunities to engage with those that are looking for our services. Other clinicians are worried about HIPAA compliance and clients not respecting boundaries when it comes to integrating tech tools in their practice, how do you deal with that? I have not found this to be an issue because I am very clear from the beginning about boundaries and have no problem having conversations about it if I feel that there is some confusion on them. Even if a client is struggling with maintaining boundaries, I will maintain mine so as to ensure consistency and model appropriate behavior. 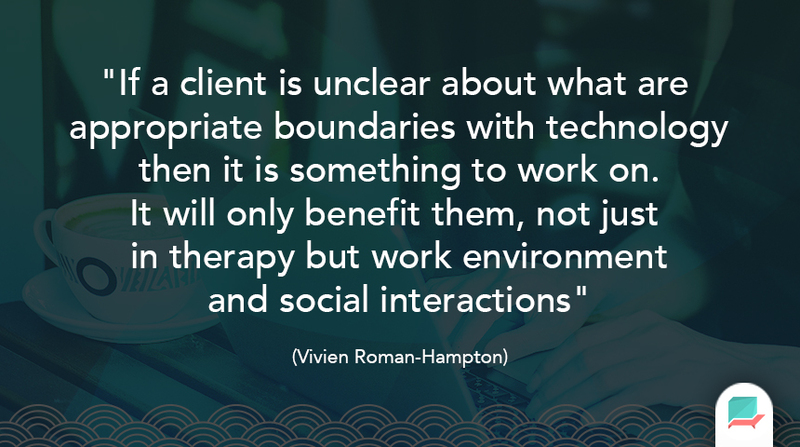 If a client is unclear about what are appropriate boundaries with technology then it is something to work on. It will only benefit them, not just in therapy but work environment and social interactions. HIPAA compliance is important and before I connect a technology to any information that could reveal a client’s information I am ensuring that they have provided notification to me that they are HIPAA compliant and/or have BAAs available for those that require that level of security to ensure that information is protected. If unsure, I can always reach out to customer support for further information or the ATA to find out if they have information on potential services. Lastly, what advice do you have for other clinicians interested in using technology? Learn and connect with others! Ask your respective governing organizations to provide clear policies on what can be used. Contact your member associations to find out what their most recent research has been on the matter. There are sites that provide online courses, make sure your documentation addresses technology (outside of, I won’t accept your friend request you on Facebook) and ask questions.